Fighting for a playoff spot in December 2016, the Minnesota Vikings suffered a debilitating 34-6 loss at home to the Indianapolis Colts. Last year, everyone was watching when Minnesota was manhandled in the NFC championship game by the Philadelphia Eagles. Sunday's 27-6 loss to the Buffalo Bills had Vikings tight end Kyle Rudolph remembering the inexplicable performances of yesteryear. "Unfortunately, you go back and look at the last three years of football that we've played, we've done this once a year," Rudolph said. "You go back a couple Decembers ago with a chance to make the playoffs and the Indianapolis Colts come in here and just kick our butts. Last year in the NFC championship game, everybody knows what happened." Perhaps no one outside of Buffalo expected this one. The Bills were 0-2 and had been outscored 78-23. Minnesota, despite the tie at Green Bay last week, was still seen as a threat to make the playoffs with Kirk Cousins at quarterback and one of the league's best defenses on the other side. "Nothing went right for us," Vikings linebacker Anthony Barr said. "That's on us. We have to make our own luck and we have to put ourselves in situations, even the fumbles they had, we couldn't even get those. You've just got to be even more aware of that, I guess, and make the plays when they're there." 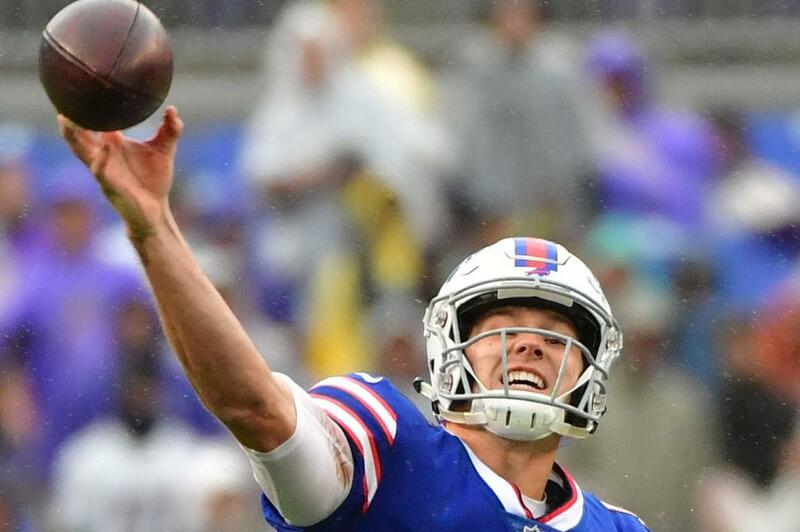 Rookie quarterback Josh Allen, making his second career start and first on the road, ran for two touchdowns and passed for one. The Bills' defense held Cousins and the Vikings to 90 yards and no points through three quarters. "Ever since I have been here, we've been underdogs, so this is nothing new for us," Buffalo cornerback Tre'Davious White said. "We just go out and play. The analysts can pick whoever they want. But at the end of the day, it's just football. We came out and executed a little bit better today." But it wasn't the first time Minnesota suffered such a loss, at least in the eyes of Rudolph. He's just not sure why it happens. "I'm glad it's only been once a year," Rudolph said. "If I knew, I thought we had one of our great weeks of preparation this week. I really thought we had three good days of practice. "I felt like we bounced back from a tough tie last week in Green Bay. I was really looking forward to coming out and playing today and kind of getting back on the right track." The Vikings never got on track, at least after an early penalty. Minnesota appeared to force a three-and-out on Buffalo's first possession, but Linval Joseph was called for a penalty for leading with his helmet. Buffalo took advantage of the opportunity and came down to score a touchdown on the drive, with Allen reaching to touch the pylon with the ball for the score. "I, obviously, didn't do a well-enough job of preparing this football team for this game," Zimmer said. "It was probably as poor a first half as I've seen in quite a while. We didn't get anything done offensively. "Special teams, we made a lot of mistakes. Defensively, we allowed the quarterback to get out and scramble and we turned a couple guys loose in coverage again today. "We're going to have to get things fixed in a hurry." Minnesota avoided being shut out at home for the first time since 1962 when Cousins connected with Rudolph for a late touchdown. Cousins finished 40-of-55 passing for 296 yards, but much of it came when the game was out of reach. Rudolph believes, while he's not sure why it happened, that the loss could benefit the Vikings. Unlike the losses to Indianapolis and Philadelphia, Minnesota has time to recover. "One thing for us is, it happened in September, so what are we going to do about it," Rudolph said. "Are we going to learn from it? This could be the best thing for us. We have a really young team and we have a very talented team, but we can't just roll the ball out there and expect to win." Zimmer doesn't doubt his team will respond and answer Rudolph's questions. "I'm not too worried about that, honestly, about getting them back," Zimmer said. "We had a bad day. We've got to play better. "Obviously, I don't have any doubts about this football team. But this is the NFL and you've got to go out and play every week. If you don't, that's what is going to happen."